This Time Albany Sets the Pace; Can Ithaca Catch Up? More often than not Ithaca is ahead of the curve, providing cutting-edge leadership on progressive issues such as the ban on fracking and new approaches to drug policy. But, as the recent letter from the City of Ithaca Planning and Development Board and Gov. Cuomo’s announcement of his Green New Deal reveal, the city finds itself lagging significantly behind when it comes to climate action and clean energy. Students strike for climate action. Photo by Stop Adani licensed under CC BY-2.0 . The call from Albany for New York’s power to be 100 percent carbon-free by 2040 — at the heart of the state’s Green New Deal — poses a direct challenge to a city hall that has shown little inclination to discourage developers from relying on natural gas for new projects downtown or elsewhere. The governor’s mandate underscores the need for immediate action by the city to demonstrate its commitment to this new statewide target. Where is the leadership for moving the community as a whole, not just city operations, off of fossil fuels and establishing a policy for achieving 100% renewable power by 2040? Will the mayor and Common Council respond to this challenge? Across the U.S., according to the Sierra Club, over 90 cities have already adopted ambitious 100% clean energy goals, sometimes even including heat and transportation, not just electricity. Why isn’t Ithaca on the Sierra Club list? The usual suspects such as Boulder, Burlington, Cambridge, Madison, and Palo Alto can be found on this list, but the appearance of other cities such as Augusta, GA, Norman, OK, and West Chester, PA make it clear that Ithaca’s absence is an embarrassment. What will it take for the city’s leaders to rectify this situation? One thing is certain: young people across the globe are getting fed up with the complacency of the older generation in charge. 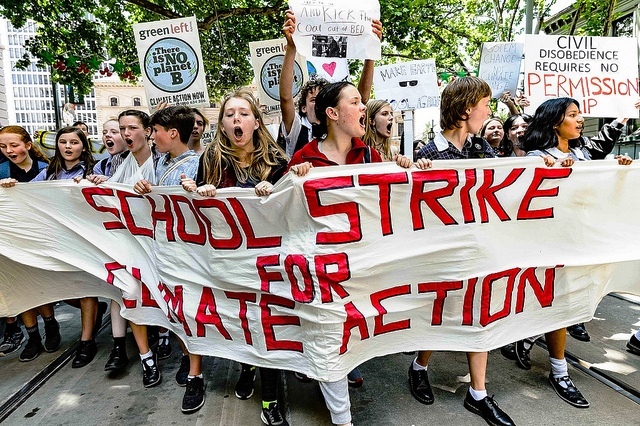 Inspired by the example of Greta Thunberg, the 16-year-old Swedish climate activist, thousands of students in the United Kingdom, Australia, France, Germany, Ireland, Uganda, Thailand, Colombia, Poland, and more are taking to the streets to demand change. On March 15, American students will have their chance to join others from around the world. It would not be surprising if Ithaca students join this global movement. If they do, will the city listen to them and be ready to demonstrate its commitment to climate action and clean energy? This post originally appeared as an opinion piece in the Ithaca Voice on March 18, 2019.